Children love books that feature popular characters and that is just fine. I also like to introduce children to books that are beautiful and books with a story to remember - future classic children's books. Books that don't get tossed in the giveaway pile but are one of those few special ones that get kept and then read with a future generation. Which books may fall in that category? Who better to ask than a very large group of librarians. Each year the American Library Association selects the Newberry and Caldecott awards. These books are usually extraordinary. 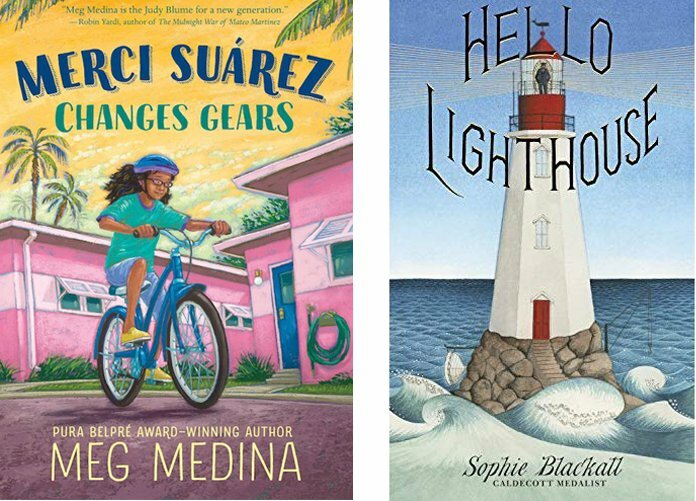 These awards were announced today at the Annual ALA Conference in Seattle. Looking for a really good book for a child - you can't do any better than on of these. Merci and her brother are scholarship middle school students at a private school and they deal with the cultural difference issues along with all the standard middle school issues. The multigenerational family dynamic adds to the story. This book gets great reviews and should be enjoyed by middle school aged kids. Hello Lighthouse, illustrated and written by Sophie Blackall, is the 2019 Caldecott Medal winner. The book is published by Little, Brown and Company. This is one of those beautiful picture books that people of all ages - from young children to adults - will love to get lost in and let their imagination seize the day. My favorite kind of book - this one will not be destined for the giveaway pile. Whether it is a sunny summer day, time for conjuring up dreams at bedtime, or a foggy Saturday afternoon, this will always be the perfect book to cuddle up with. Both of these books are available at Amazon. Click below to check them out.